Carved from the marshlands of the San Diego River Estuary in the 1950's, Mission Bay is one of the nation's largest man-made city parks. 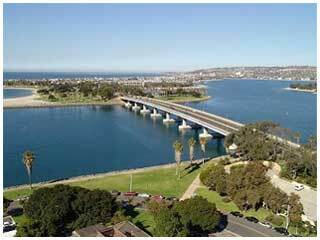 It's about nine square miles of sheltered beaches, grassy parks, bicycle paths, marinas, hotels, and Sea World. Visitors often don't see much more than Shamu doing belly flops but the locals know better. Take advantage of the uncrowded beach paths. Hit the path at Bayside Walk, starting west of the Bahia Hotel, and head northeast to Crown Point Shores. If it floats, you can rent it at Mission Bay. You can rent boats and take lessons. In the mornings, the ocean breeze is still light or nonexistent. The bay is one of the best places to try sea kayaking. Hit the beach. The most crowded areas (to see or be seen) include the southern portion of Crystal Pier or the end of Mission Bay Drive (roller coaster area). For a little more room, just go south of either region. At the very southern end of the beach are dozens of volleyball courts and an outdoor basketball court donated by NBA legend Bill Walton, who grew up playing here. You can rent all kinds of surfboards, boogie boards, roller blades, and bikes on the boardwalk. If you enjoy sailing, you must catch the breeze on the bay. You can rent windsurfers and all types of boats from small Capris ($20 per hour) and jet skis ($65 per hour) to a Catalina 30 ($175 for four hours) at Quivira Basin, the bay's largest rental operation.